I didn't book Soccernomics to read, only because of soccer. I wanted to read it to understand the power of data analytics. It turned out to be interesting also from soccer point of view. Book looked soccer from all the different angles. 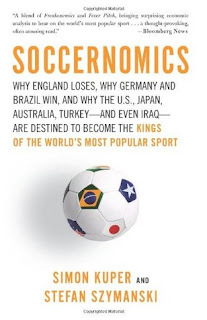 It explained the economics of soccer, how money does mean a lot in soccer. Also it explained why some team are better on their transfers. But it does talk also quite much about what's happening in the field. The whole idea of the book is to analyze countries and their enthusiasm towards soccer. Then based on many different data select, which are countries that will in the future dominate soccer. I liked the book very much. It was just the season of Leicester winning the Premier league, which kind of destroyed some of the thoughts of the book. Most probably Leicester was a one season wonder and can be explained as a statistical bias. Still for the sake of soccer, I wish the thoughts in the book don't happen exactly as they predict. It was an interesting book and I recommend to read it. Statistics and statistical analysis is field that will grow all the time, when more and more data becomes available. This is a good start to understand it more.